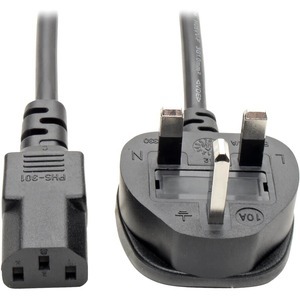 The P056-006-10A Standard UK Computer Power Cord features a C13 plug on one end and a BS-1363 UK plug on the other, allowing you to connect your computer or peripheral to any grounded AC power outlet in the United Kingdom and many current and former British Overseas Territories. Simply connect the C13 plug to a device and the BS-1363 plug to a UPS, PDU or AC wall outlet. Take the heavy-duty P056-006-10A with you on a trip abroad or replace an old or lost power cord. This six-foot 250V/10A cord features H05VV-F 3G 1.0mm² wire, a flexible PVC jacket and fully molded ends for optimum performance. Standard UK Computer Power Cord, 10A (IEC-320-C13 to BS-1363 UK Plug), 6-ft.